Active since its startup in 1999, LDSPlanet.com is the top-ranked dating website for Latter-Day Saints Mormon singles and has a very large membership base. The LDS dating website is currently owned by IAC/InterActiveCorp, an American Internet and media company that owns a kaleidoscope of dating websites and online brands. This website ownership does have its advantages and allows LDSPlanet to host the sophisticated features modern singles have come to appreciate. LDSPlanet.com offers many mainstream dating site features such as flirts, live chat, and likes. It also suggests handy 'Message Ideas' to help you craft a small description of your interests on your profile to break the ice with other members, which is an extremely helpful tool when you're confounded with what to say about yourself. The site also gives you greater control over the accessibility of your profile than some well-known secular sites, which is an important tool to have for devout Mormon singles. LDSPlanet guides you through sections in a landing page style that helps you establish a username, password, geographical area, and other information to build your profile for the first time. Uploading a photo of yourself is not required, but is encouraged since other users won't be able to see you without having one on your profile. The site also allows you to upload a photo from your Facebook account - a nice option to have if you want to cross-reference between the two. 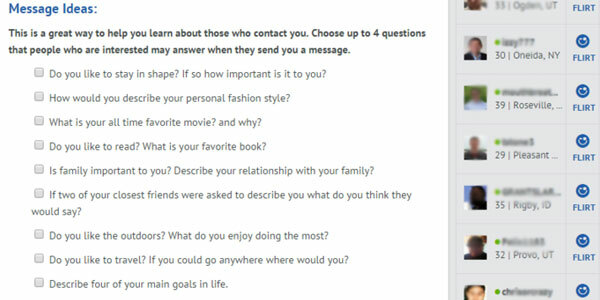 Questions about your personality and current status in the Mormon religion add further personalization on your profile but are also optional. The initial setup itself is simple and painless to use for even those who aren't as tech-savvy. Like most top-rated dating sites, LDSPlanet.com is a paid service that lets you set up a profile and view profiles of other members for free. But a paid monthly subscription is required if you want to view others' messages to you and start a conversation. That said, LDSPlanet's monthly rates tend to be lower than other Christian dating sites at only $16.99 per month, and is about $5 lower than secular dating sites on average. The Mormon site also allows you to upgrade your profile with more features for an additional fee, which is a nice benefit if there was a way to know about your payment options ahead of time. In this LDSPlanet.com review, the site navigation was very easy and simple to use. The color palette is pleasing to the eye and helps make finding the buttons you're looking for easier to see. Using the live chat feature to interact with other members was a quick process; just click on who you want to talk to in the box on the right, and you're ready to go. Socializing is simple with, quite literally, the click of a button. LDSPlanet lets you search through its huge member database through several different ways. 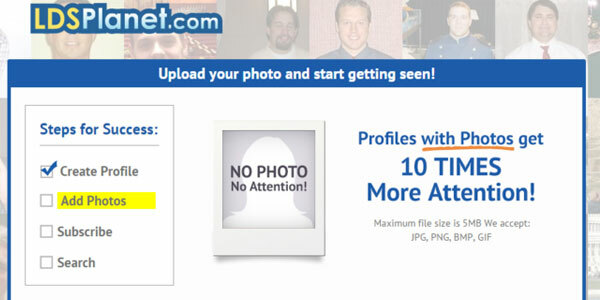 First, it presents you with a handful of profiles as potential matches according to your profile. You can fine tune this feature by selecting 'yes' or 'no' with each profile you look at. 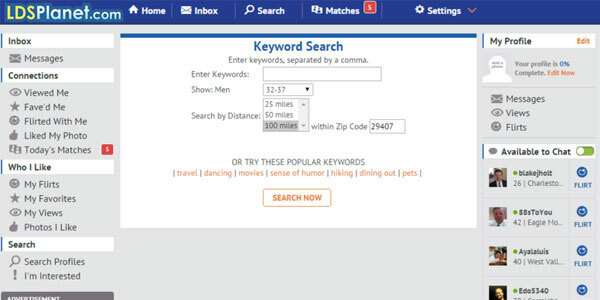 You can also search profiles with its search engine based on age range, distance, and the certain keywords you feed into the search bar such as 'sense of humor,' 'pets,' 'travel,' and so on. It also lets you search members who have the same birthday as you do, which is a pretty cool feature and conversation starter. LDS Planet is one of the top religious dating sites on the market for a good reason - it hosts an enormous member database, showcases quality dating site features, and is easy to set up and use. However, a paid membership is required to take advantage of its full benefits, and the website lacks a mobile app for smartphones and tablets. Since LDSPlanet.com has a specific niche geared for LDS Mormons, it may not be the right fit for Christians in other denominations, and a different Christian website like ChristianMingle.com might be a better option. Feel free to read our review of ChristianMingle.com to find out more!